no matter your age or ability. "Amy customized a training plan for me based on my fitness level and experience and coached me through my first half marathon and sprint triathlon. She adjusted my plan throughout the training cycle as needed so I was able to get to the starting line feeling confident and prepared. Her knowledge, guidance, and support was invaluable and I couldn't have done it without her!" 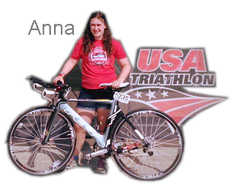 ​"I signed up for Amy's beginner triathlon class with the goal of finishing a triathlon and getting into better shape. Amy provided a great teamwork atmosphere that had a great blend of fitness and fun. Amy also understands the pressure of being a working parent of two active teenagers with busy schedules and how that impacts training. Not only did I finish my first triathlon under Amy's coaching but Amy got me hooked on a sport that a plan to continue. I encourage anyone how is looking for a coach who motivates and guides, to give Amy a call." "Amy helped make my dream of running a marathon one day into a reality. As a person with chronic health problems, I was unsure if I would ever achieve this goal. Amy was instrumental in helping me learn how to fuel properly, train to my fitness level, and maintain my health." "As a lifetime couch potato who finally decided to get moving, Amy helped motivate and guide me from zero miles to running my first 5K. Having a plan and accountability was invaluable! Thank you Amy! I couldn't have done it without you." If you have questions, please don't hesitate to ask. We love to help!